Posted on 11, December 2015 by EuropaWire PR Editors | This entry was posted in Awards, Energy, Gas & Oil, Finland, Industrial, Transportation & Logistics and tagged Harvey Gulf International Marine, LNG fuelled offshore supply vessels, Wärtsilä engines, Workboat magazine. Bookmark the permalink. 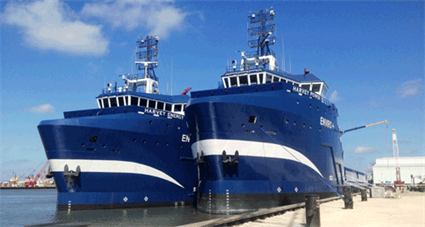 HELSINKI, 11-12-2015 — /EuropaWire/ — The annual Significant Boats awards programme, hosted by Workboat magazine, has recognised Harvey Gulf International Marine’s LNG fuelled offshore supply vessels, powered by Wärtsilä engines, as the Workboats of the Year for 2015. The award was announced at the 2015 International Workboat Show in New Orleans. The strong partnership between Harvey Gulf and Wärtsilä has been developed through very close cooperation during the sales, construction, commissioning, and delivery phases. This has been a key factor in ensuring high quality and operational success. The cooperation has been further cemented with a 5-year Technical Management Agreement, in which Wärtsilä has committed to providing long term field service, as well as workshop and spare parts support, from Wärtsilä’s newly-completed service facility in New Orleans. Since beginning operations in February 2015, the Harvey Energy has experienced no time off charter and has met or exceeded all expectations. Delivered in October 2015, the Harvey Power has continued in the same vein and is performing flawlessly, with both Harvey Gulf and the charterer being very well pleased. The Harvey Gulf OSVs were selected from the top 10 Significant Boats of 2015. The awards focus on the technical innovation aspects of vessels operating in the workboat industry. A special recognition breakfast was hosted by Workboat magazine on Wednesday, December 2. The Harvey Power and Harvey Energy OSVs are powered by Wärtsilä dual-fuel solutions.